The authors bring a dual perspective-that of a practicing consultant and that of a professor of economics-to the complex strategic questions facing managers and corporate leaders who want their firms to get the most out of their investments in information technology. The information economy is built upon the myriad and sometimes unforeseen ways in which information technologies have become engines of productivity in themselves, rather than just fancy adjuncts. In explaining the rise of the information economy, the authors provide not only valuable context often missing from today's discussions but also a thorough understanding of the origination, development, and diffusion process of innovations. They also examine prevailing practices and implications for the future, including the potential pitfalls common to some information technology strategies. Relying on an underpinning of economic theory combined with heavy empirical analysis, Kudyba and Diwan describe the true nature of the information economy, paying as much attention to its particularities as to its more profound implications. How is information technology being implemented across industry sectors, and how can it be harnessed to improve overall firm-level productivity? How have innovations in high technology impacted e-commerce? Which e-commerce strategies prevail, and what can be expected of them? How can traditional economic theory help managers evaluate such in-vogue strategies as customer relationship management, market exchanges, and supply chain management? The authors answer these questions and more, including one of the most vexing in the short history of e-commerce: What led to the demise of so many technology stocks and dot-coms following the spring 2000 Nasdaq plunge, and what are the longer-term prospects for e-business? "This book provides a comprehensive look at how IT has changed everyone's life and the way we do business. 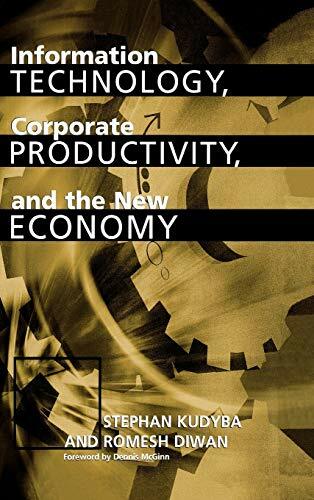 The authors have done an excellent job at illustrating how corporate America has embraced the concept of information technology to increase both productivity and profitability. The competitive strategies discussed in this book can be employed across all firms, either large or small. If you want a clear understanding of the 'new economy, ' take the time to read it. "-Quinn Degner, CFA Senior Vice President, Global Derivative Sales HSBC Securities (USA) Inc.